Birdfoot Grape-Vine is a large but week climbing shrub, completely hairless. Tendrils are leaf-opposed, branched, wiry, coiled. Leaves are alternate, pedately 5-7 foliolate, hairless; leaf stalks 2-7 cm long; at branch-ends leaflets elliptic to egg-shaped-lanceshaped, 5-12 x 3-6 cm, base rounded or pointed, tip tapering, margin toothed with saw-like teeth, stalk 1-2 cm long; lateral leaflets 2.5-9 x 1.5-5 cm, base unequal, stalk up to 1 cm long. 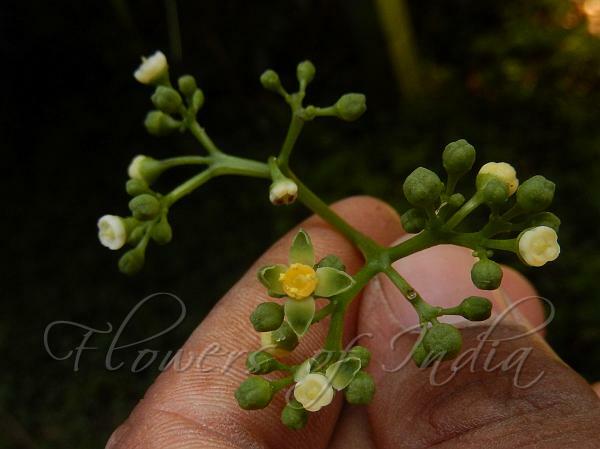 Flowers are bisexual, hairless, greenish yellow or yellowish white, about 3 mm across, placed on about 10 cm long branched, in leaf-axils corymbs. Berries are spherical, about 1 cm across, creamy white. Seeds 1-2, flat, semicircular, smooth. 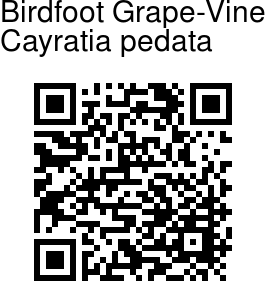 Birdfoot Grape-Vine is found in Indo-Malesia. Flowering: March-June. Medicinal uses: The whole plant of Nilgiri Grape-Vine (excluding the roots) has low diuretic activity and has been a reputed remedy for cough, bronchitis, asthma, joint pain and to check uterine reflexes. Identification credit: Siddarth Machado Photographed in Niligiri Biosphere Reserve, Tamil Nadu.